More photos from last Thursday’s historic bill signing! It was a good day in Montpelier yesterday, and not just because the sun was shining bright and warm. 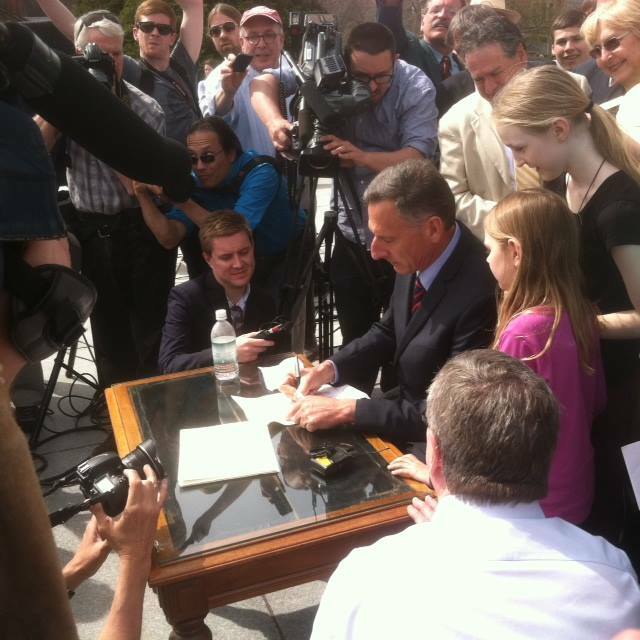 On May 8th, Governor Shumlin signed Vermont’s GMO labeling bill into law making Vermont the first state that will require labels on genetically engineered foods! The law will require labels on genetically engineered foods (also called genetically modified organisms, or GMOs) sold at retail outlets in Vermont, and will go in to effect on July 1st 2016. The law would also prohibit labeling products produced with genetic engineering as “natural”, “100% natural” or “all natural”. 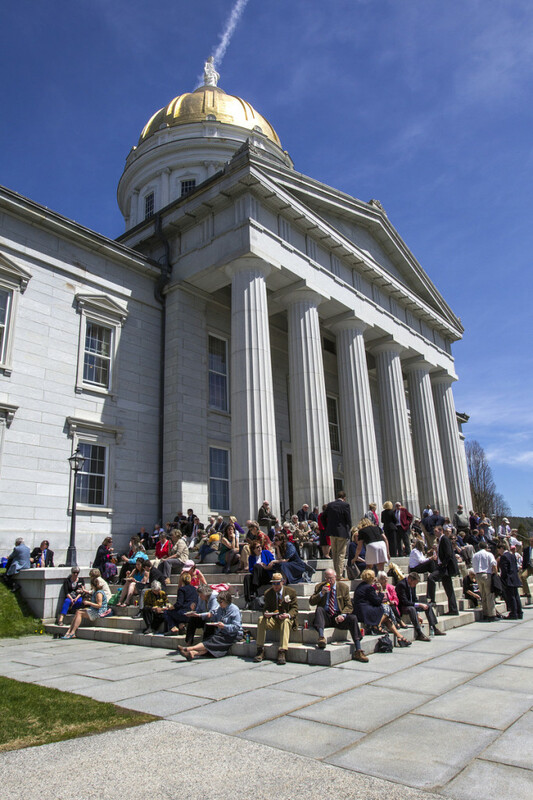 The bill signing took place on a beautiful afternoon on the State House steps, was well attended, and was followed by a celebration accompanied by several musical performances and Ben and Jerry’s scooping free ice cream for all in attendance. “This victory, which will benefit everyone who eats, has been a long time coming but it is no less sweet. 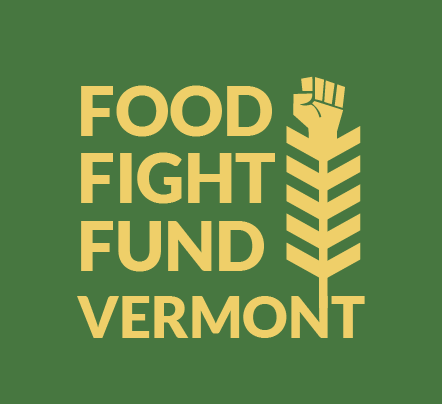 Rural Vermont is grateful to the thousands of Vermonters who stood up for their right to choose the food that supports their values,” said Rural Vermont Executive Director Andrea Stander. “This law is a testament to the work of thousands of Vermonters over the last two years who strongly believe in the simple right of everyone to have basic information about the food they buy and the agricultural practices their food dollars are supporting,” said NOFA-VT Policy Advisor Dave Rogers. Laura Murphy, Associate Director of the Environmental and Natural Resources Law Clinic at Vermont Law School, commented on the bill signing saying “The clinic was proud and honored to be a part of this process in Vermont, and to help make the legal case for the bill. We couldn’t have done it without all of you! Thank you all for your support, your continued involvement, and most of all, your passion. Not only did you make this happen here in Vermont, but you’ve helped to provide an inspiration and a model for the rest of the country to follow. We did it! Celebrate the bill signing! Join us in Montpelier, or online! 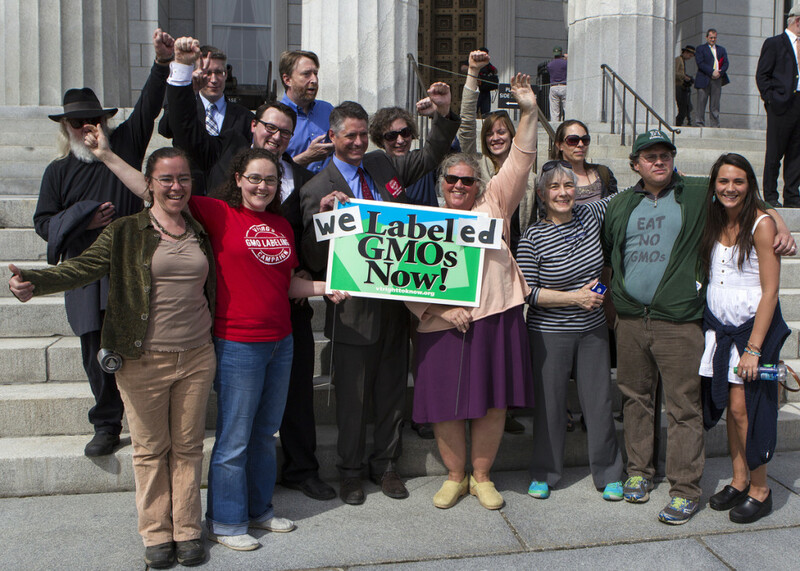 Join us tomorrow to celebrate Vermont becoming the first state in the nation to require labeling of GMO foods! 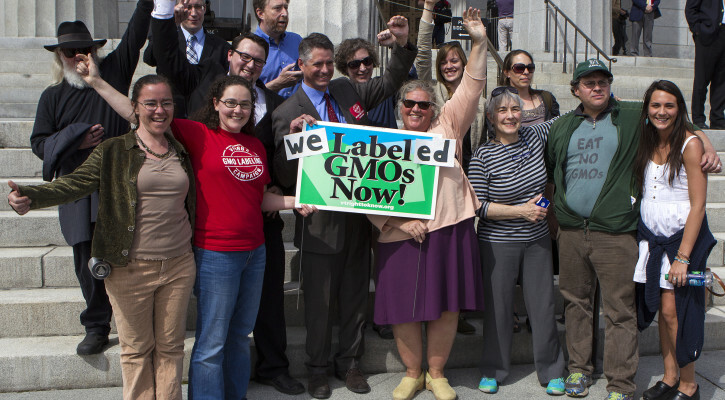 The festivities will kick off at 2:30 on the State House steps where Governor Peter Shumlin will sign Vermont’s no strings attached, GMO labeling bill in to law. After the bill signing stick around to celebrate this incredible campaign! There will be live music by Bob Stannard and others, Ben and Jerry’s will be scooping free ice cream and High Mowing Seeds will be distributing seed packets. Bring family, friends and a picnic lunch and celebrate this historic moment with everyone from the VT Right to Know team. Check out our event page for the latest details on the event, hope to see you there! If you are looking for parking in Montpelier click here, and if you have questions on the day of the event you can call Cat at 802-359-3330. For those who can’t make it you can find a live stream of the event here! Bill to be signed on May 8th! 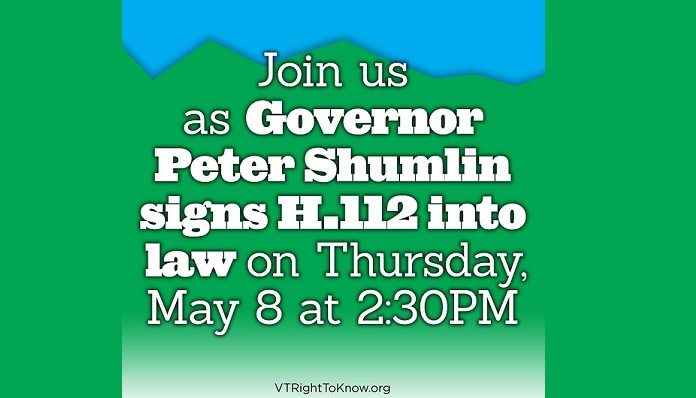 On Thursday May 8th at 2:30 Governor Shumlin plans to sign H.112 (Vermont’s GMO labeling bill) in to law on the steps of the State House. We hope that you will bring your friends, family and a picnic lunch and join us in Montpelier for this historic moment! It’s time to celebrate! For those of us who have spent the past couple years working on this campaign now is the time to come together and celebrate our victory! Everyone is invited and we can’t wait to see you there. We will be in touch with more information and the possible rain location when we know more. Thank you for being part of this incredible campaign, you helped make history! Bill Heads to the House Floor! On Tuesday, the House Agriculture Committee voted 9-2 and the House Judiciary Committee voting 7-4 in favor of concurring with the Senate version of H.112! The House Appropriations Committee also noted their approval of the legal fund as set up by the Senate. 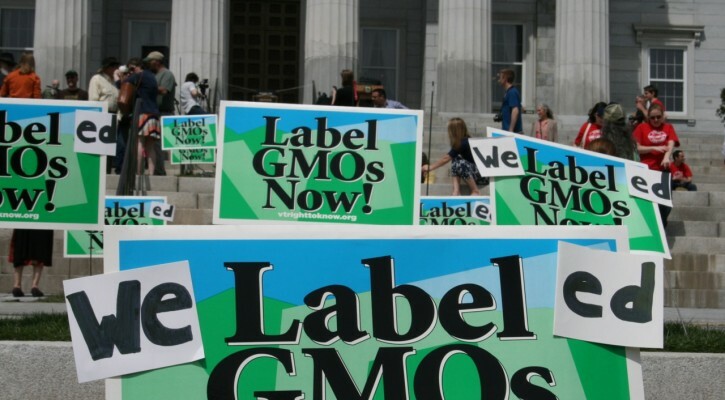 Vermont’s “no strings attached” GMO labeling bill will now go to the House floor this afternoon for a possible full vote of the House of Representatives. This it it! If the House votes to concur, then the bill will head to the Governors desk for his signature! For more information about Tuesday’s vote, check out the news coverage from WPTZ and the Burlington Free Press. 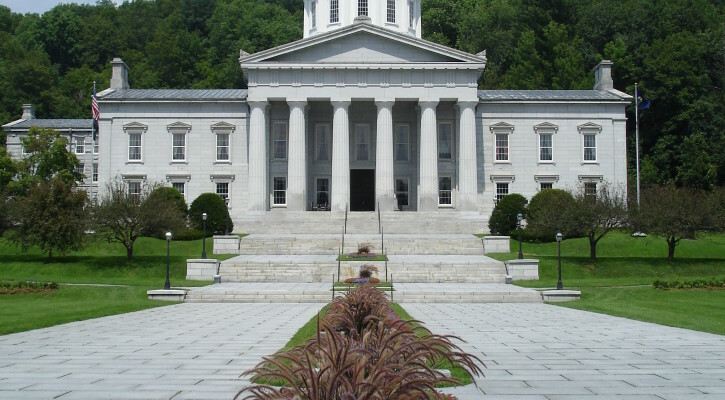 For those that wish to join us in Montpelier, we expect the House to convene at 1:00pm. If you can’t make it, you can tune into the VPR live stream or make sure to check our facebook and twitter for the latest news! 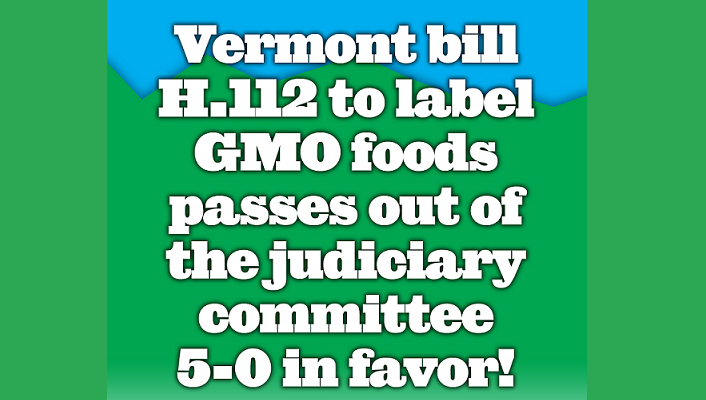 Following Tuesday’s initial approval, the Senate officially passed Vermont’s GMO labeling bill (H.112) 28 to 2 on Wednesday! This historic vote moves Vermont ever closer to becoming the first state to require labels on the GMO foods. The bill will now head to the House of Representatives where they will decide whether to concur with the Senate’s version of the bill, or create a conference committee to iron out the differences. 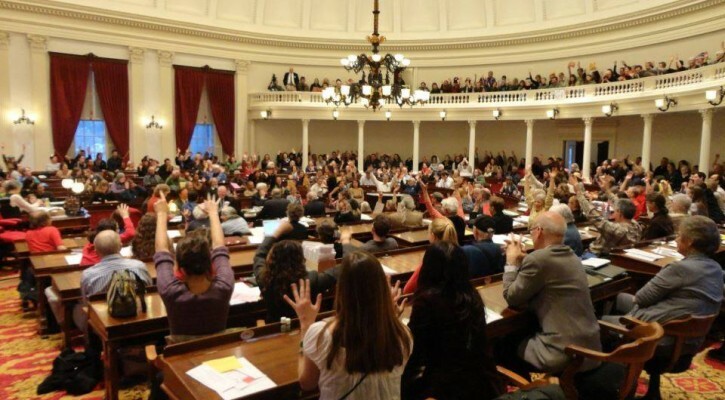 To visibly demonstrate the broad support for this bill we are calling for “honk and wave” events next Tuesday, April 22 (Earth Day) during morning “drive time” not just in Vermont but all across the country. Our national partners and supporters are helping to organize this. Use this online tool to set up and share your local honk and wave! In case you don’t know, a “honk and wave” is when you and your friends get some signs together, set up shop on a street corner (or highway overpass) and rally in front of motorists in support of GMO labeling. Please plan to snap a picture of your event and post it to the VT Right to Know Facebook page. Keep checking our website for the latest on where people will be gathering, and make sure to share your pictures with us on Facebook, Twitter or via email. Thank you so much for everything you have done to get us this far! 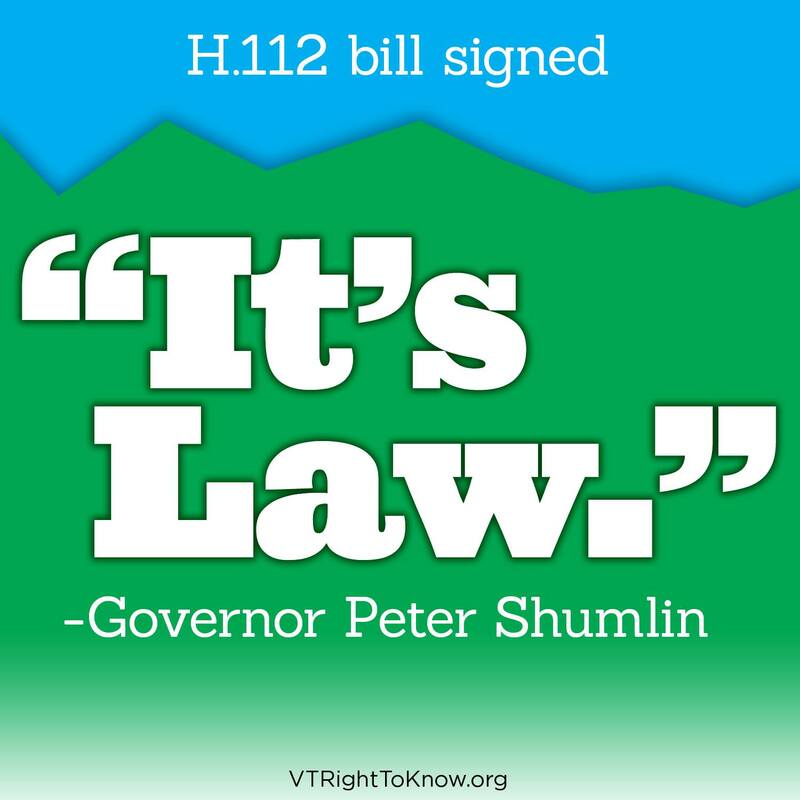 Senate Gives Preliminary Approval to H.112! 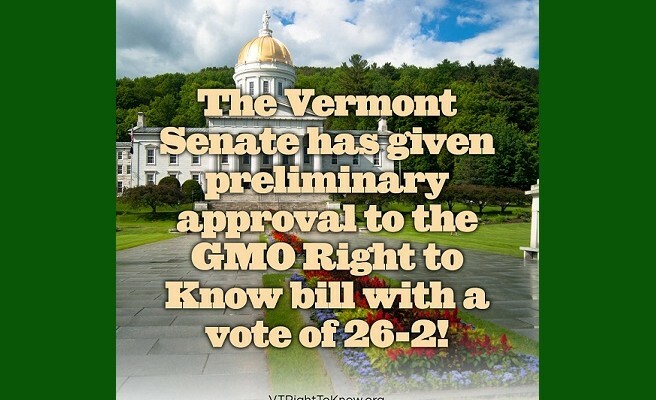 On Tuesday the Vermont Senate gave preliminary approval to the GMO labeling bill, by a stong margin of 26-2! After nearly two hours of discussion, the majority of our senators stood with us in supporting H.112, accepting all the amendments as passed by the committees. 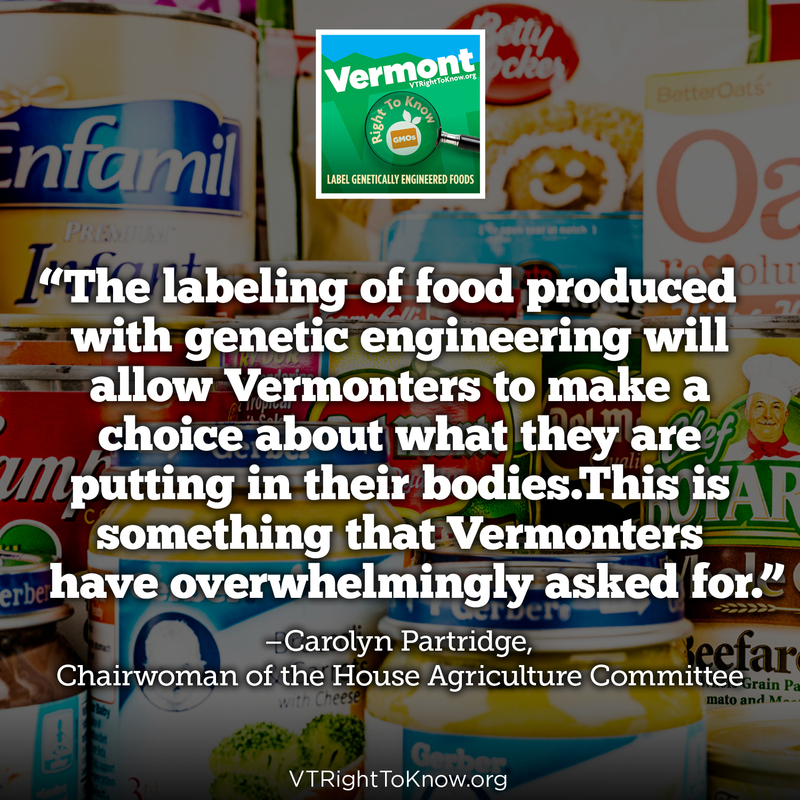 The bill remains without a trigger, and if enacted would go into effect in July of 2016, setting the course for Vermont to become the first state in the nation to label genetically modified foods! Want to find out how your senator voted? Check out the roll call from Tuesday’s vote, and consider writing a letter to the editor thanking your senator for their support! The bill will be read a third time Wednesday afternoon, at which point the final vote will likely occur. P.S. Mark your calendars for next Tueday, April 22nd! In celebration of Earth Day, we are organizing “honk and waves” throughout the state (and beyond) where you can show your support for, and raise awareness of, the GMO Labeling bill! Stay tuned for more information! H.112 passes Appropriations Committee, Heads to Senate Floor! 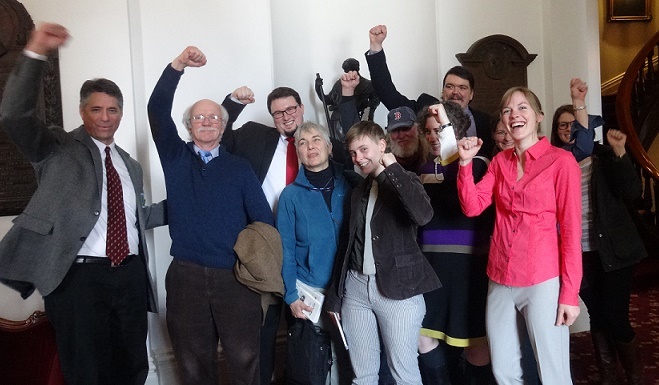 Vermont’s GMO Labeling bill took another leap forward today as it was passed 7-0 by the Senate Appropriations Committee! The bill is now being scheduled to head for the Senate floor for a possible vote early next week! While there won’t be opportunity for public input, folks are invited to attend the proceedings if they would like. Make sure to double-check the Senate schedule before heading out, and remember that no electronics, cameras, food or drink are allowed in the Senate chamber. For those who’d like to stay tuned from home, you can listen in via VPR’s Senate stream and follow along on our twitter page to stay on top of the action. Judiciary Committee Unanimously Passes H.112! 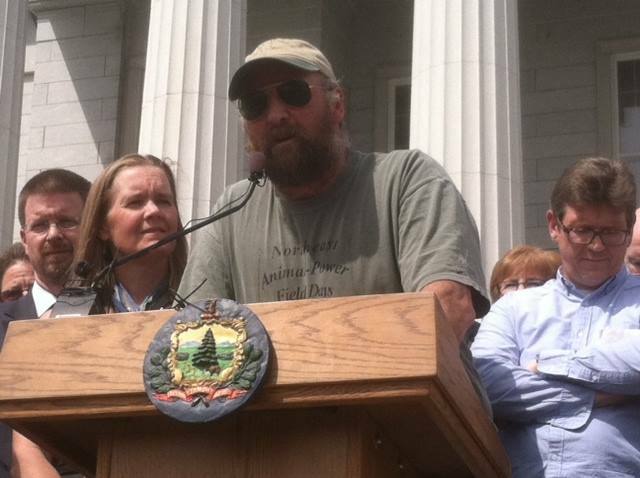 Today was a big day in the push to label GMO foods in Vermont. The Senate Judiciary Committee voted 5-0 to move H.112 forward. The bill would put labels on GMO foods starting July 1st, 2016, independent of the action of other states! The bill will be moving on to the Appropriations Committee next week and then hopefully to the Senate Floor. The Appropriations Committee will look at how to create a fund for individuals to contribute to help with implementation of the law. This fund will give people the opportunity to contribute towards the bill’s legal defense, but will not act as barrier for the bill going into effect. Any money contributed will only strengthen and supplement the funds used by the Attorney General. Members of the Judiciary Committee worked tirelessly throughout the month of March to craft H.112 into an even stronger, more defensible bill. 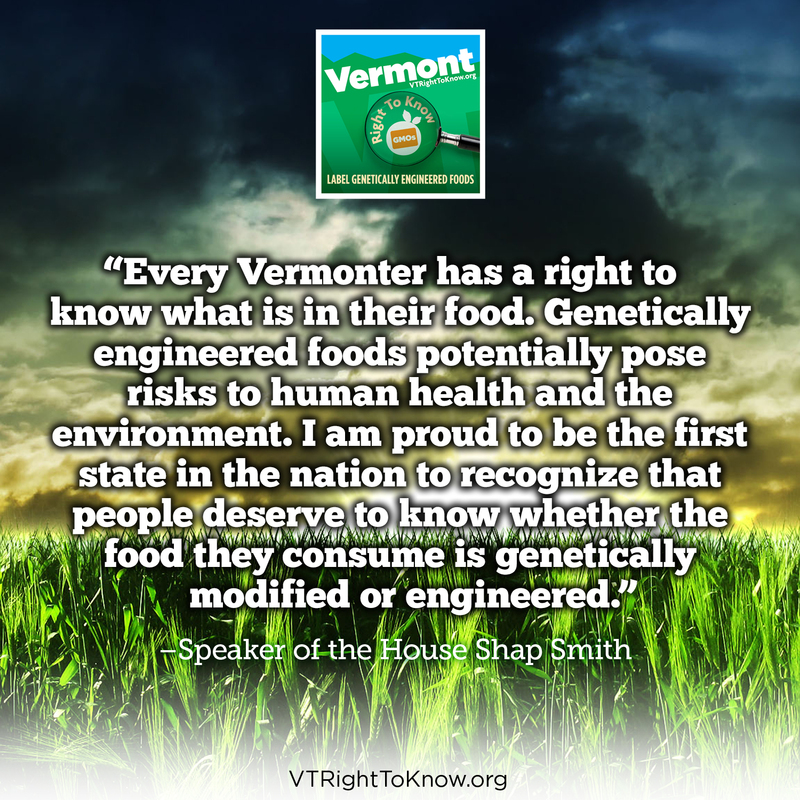 They unanimously voted in support of labeling GMO foods and Vermonters’ right to know. Contact and communication from great supporters like you is what helped your Senator make the right decision. Please let them know you appreciate their hard work. Sign on to show the Senate Judiciary Committee your gratitude! You can make sure other Senators in your district also stand up for your right to know by contacting them personally. Click here to reach out to your other Senators. The campaign is looking good, folks! To date, over 36,000 people and 236 businesses have signed on in support of the bill, either through a physical sign-on or via our online petition. And we’ve had 22 letters to the editor published in support of H.112. At this crucial stage in the campaign, please consider taking a few minutes to make this number even bigger and let your community know why you want to see labels on GMO foods! Tell your story in a brief letter to the editor of your local paper - you will help start a conversation with your neighbors and you will get the attention of our legislators.